Can North Carolina Be a Tipping Point State? 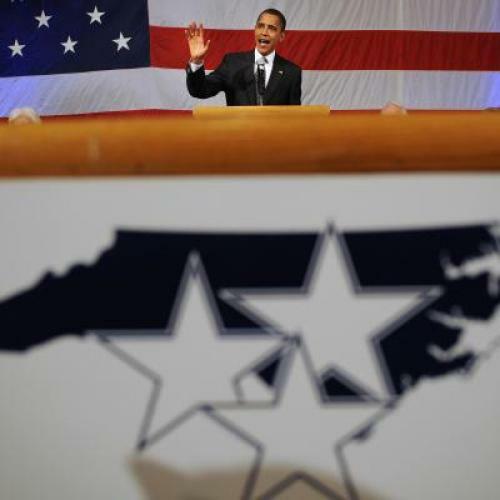 In 2008, Obama won North Carolina by less than 1 percent while winning by 7 percent nationally. After four years, Obama’s big national lead has vanished, but Obama and Romney are spending away in the populous and diverse mid-Atlantic state. According to the Washington Post’s ad-tracker, the two campaigns spent $1.7 million in North Carolina last week, similar to the other big battleground states like Florida ($1.8m), Ohio ($1.9m), and Virginia ($1.5m). The FiveThirtyEight tipping point state index, designed to estimate the chance that a state might prove decisive in a tight national election, judges North Carolina nearer to New Jersey than any competitive state. So why are the campaigns pouring millions into the Tar Heel State? The answer lies in the state’s unique demographic profile, which creates scenarios where Obama might need to win North Carolina in the event of a close national election. The current national polling outlines the demographic contours of a closely contested race: Obama would hold most of his non-white support from 2008, but suffer big losses among white voters, and particularly white working class voters. If one averages the demographic subtotals from the most recent Pew and Gallup polls and weights them to 2008 turnout, Obama would hold 49 percent of the vote—just what he would hold in the event of a tied election. There is no guarantee that the electorate looks just like 2008, and Obama’s share of the vote based on current polling changes with the composition of the electorate. Today, the Obama campaign indicated that whites would make up just 72 percent of the electorate this year, down from 74 percent in 2008. That is certainly possible, but so is decreased youth and African American turnout rates along with a surge of conservative white voters who didn’t participate in 2008. Given the national polls, a closely contested election would entail unusual polarization along racial/ethnic lines. In that context, North Carolina could play a critical role in a close national election. As a general rule, Obama should hold firm in states where Obama’s political fortunes are least dependent on the support of whites, and particularly working class whites, and suffer big losses in states where Obama was heavily dependent on whites without a college degree. Of all the battleground states, Obama’s coalition in North Carolina is the least dependent on white voters and the second least dependent on support from the white working class: 50 percent of Obama’s supporters in North Carolina were African American and only 27 percent of his supporters were whites without a college degree. The same demographic characteristics that potentially make North Carolina resilient to the national headwind eroding Obama’s support nationally also make Obama vulnerable to big losses in the Upper Midwest. Obama’s support in Wisconsin, Iowa, Michigan, and Ohio is overwhelmingly white, and nearly 50 percent of his 2008 supporters were whites without a college degree. Is there a scenario where Obama loses so much support among working class whites that he loses Iowa and Wisconsin, but remains strong enough among college educated whites and blacks to compensate with a win North Carolina? Obama could certainly lose upper Midwestern states, but the challenge for Obama is that even minor losses in North Carolina would be sufficient to flip the state, since Obama won by just 14,177 votes four years ago. However, there are countervailing demographic forces that could counteract, even if not overcome, Obama’s losses among white working class voters. Northern professionals continue to flock to the burgeoning Raleigh-Durham metropolitan area, even if at a lesser pace than the explosive growth experienced prior to the financial crisis. North Carolina’s youth is more diverse than the rest of the state, and four more years of young voters will tend to produce a more diverse electorate. The Democratic National Convention will be in Charlotte, which might help the Obama campaign organize their ground operation. There is also a chance that Obama might hold more of his support among white working class voters in North Carolina than other states. As mentioned before, white working class voters are far more diverse than the media portrays, and it is hard to say exactly which white working class voters are heading for Romney, let alone where. State polling and Quinnipiac probably provide the best clues. State polls show a close race in Upper Midwestern states that voted overwhelmingly for Obama in 2008. In contrast, Obama seems to be holding on among white voters in North Carolina and Virginia. Quinnipiac’s state polling shows Obama bleeding white working class voters in Ohio, Pennsylvania, New Jersey, New York, and Florida, but not in Virginia, where an overwhelmingly southern white working class cohort offered relatively little support to Obama in 2008. Given that the two campaigns are competing in North Carolina, it seems reasonable to assume that a similar phenomenon might have taken hold in the Tar Heel State. The scenario where North Carolina proves pivotal is not hard to imagine. If the non-white share of the electorate increases in 2012, then a tied national election would entail further Obama losses among white voters beyond those already incurred and Romney consolidating the entire undecided white vote. In such a scenario, Ohio would race into the GOP column as Romney mops up disaffected white voters, while Wisconsin and Iowa would stand as hotly contested toss-ups, perhaps even tilting Republican on election day. The same demographic changes propelling the non-white share of the electorate higher nationally would have an outsized effect in diverse and growing North Carolina, allowing Obama to compensate for modest losses among the third of white working class voters who preferred him in 2008. If Obama lost Wisconsin and Iowa, or even Iowa and Michigan, a win in North Carolina would put Obama back over 270. While this scenario might seem outlandish to those accustomed to the red-blue divides of the Bush era, polls suggest it is possible, explaining why North Carolina is contested and how it could prove crucial in a tight race.